The Cinderella story with a twist, Rossini’s Cenerentola has all the magic of the fairy-tale –and more. The composer’s sparkling score, with the lightness of touch that characterisesso much of Rossini’s work, lifts it up even further. 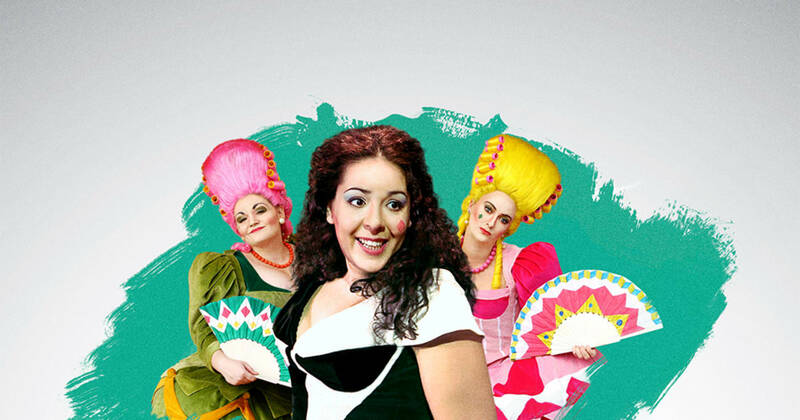 This revival by the WelshNational Opera , first performed back in 2007, cleverly uses a clutch of talented Italian singers performing the central male characters, giving extra appeal when touring to European cities. 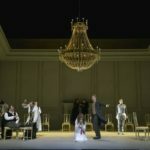 This is comic opera at its best. 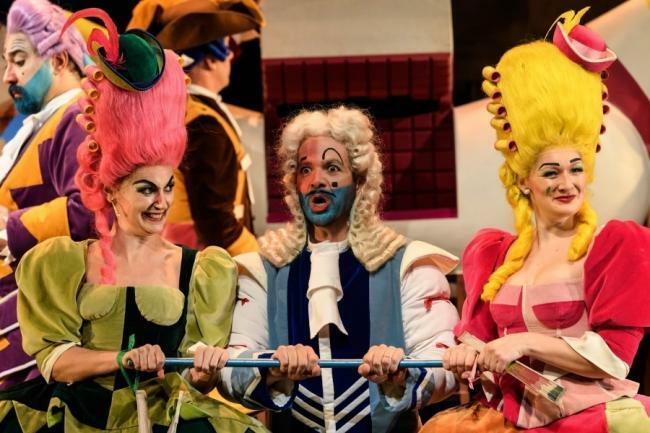 Cenerentola keeps most of the ingredients of the fairytale with which we are familiar, with one notable exception. There is no glass slipper. Instead we have a sparkling bracelet – two, to be exact. – the reason being that when the opera was conceived, in Rome back in 1817, it would have been considered bad form to show a lady’s ankles on stage. 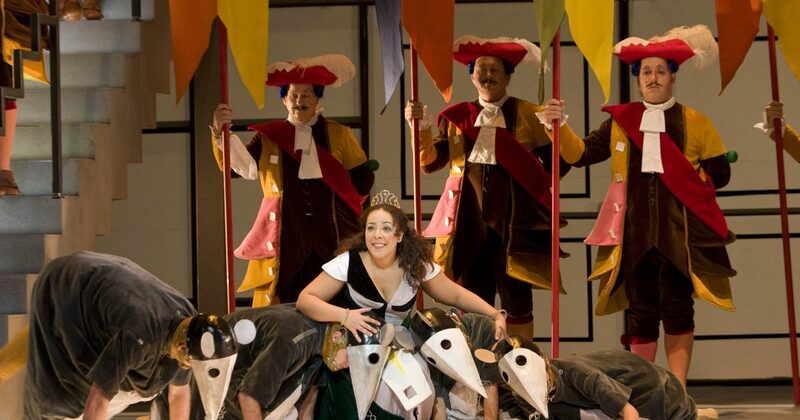 Act I opens with the Cinderella of the story, here named as Angelina, slogging away at the housework, in the crumbling castle overun by mice where she slaves away trying to cope with the demands of her two ugly sisters Clorinda and Tisbe and trying in vain to get some sign of affection from her self-important stepfather Don Magnifico – portrayed with gusto by Fabio Capitanucci. 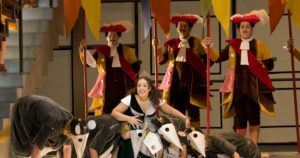 His evident enjoyment of the role, coupled with a sonorous bass, makes this singer a perfect choice for the part. 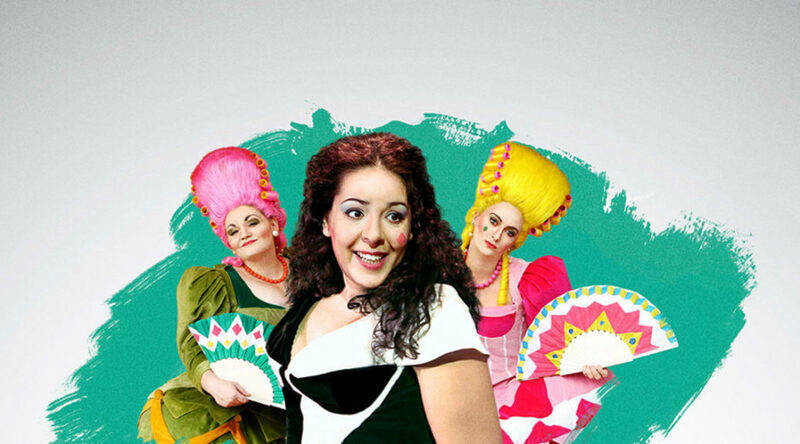 Irish mezzo-soprano Tara Erraught has a voice of exceptional depth and clarity which calls forth our sympathy as she is vilified and hassled by Clorinda (Aoife Miskelly) and Tisbe (Heather Lowe), both of whom give great performances as the two throughly nasty stepsisters who make Angelina’s life a misery. The arrival of Alidoro (Wojtek Gierlach),officially the Prince’s tutor and mentor but actually a kind of wizard in place of the traditional fairygodmother, disguised as a beggar, hints at the chnages to come. Angelina’s kindness convinces him that she is the bride for his Prince Don Ramiro (Matteo Macchioni). 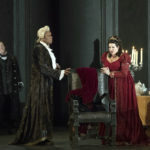 Macchioni’s pleasant tenor blends well with Erraught in their duets, but with the change of identity – his valet Dandini (Giorgio Caoduro) masquerading as the Prince andvice versa – it is the latter whose performance in Act II is of particular note. 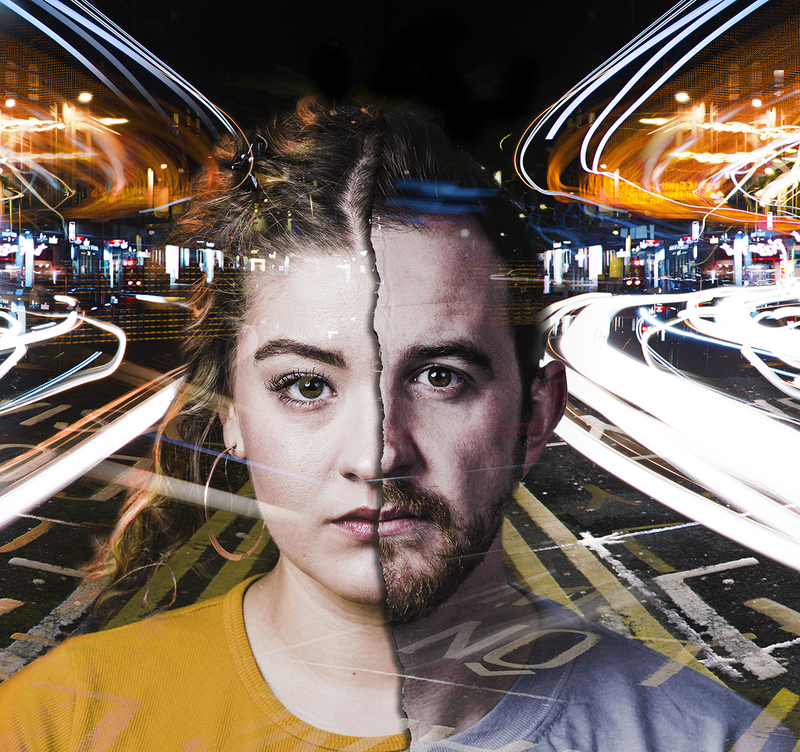 Set against a minimalist backdrop presided over by a giant fireplace centre stage, WNO’s revival is notable for its attention to detail – watch closely in order not to miss any of this. 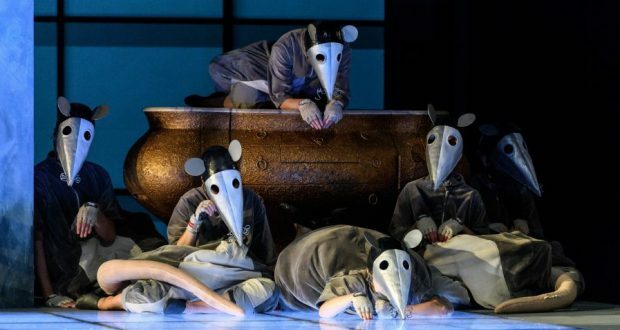 The stepped stage could be hazardous but at Sunday’s performance any possible pifalls were dexterously avoided, not least by the team of dancers that make up the pose of mice that is a feature of this production, swishing their tails and gesturing on stage throughout. So enchanting are the make-believe rodents and so expert their delivery of revival director and choreographer Xevi Dorca’s great choreography that they are at times in danger of diverting our attention from the main action as the story unfolds.There is a cleverly portrayed storm, an overturned coach, and much more to excite as Dandini and the Prince change back to their true persona and Anglina/Cinders dream comes true. 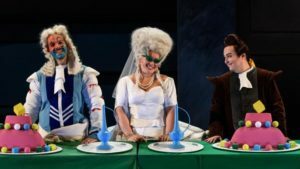 A happy-ever-after ending – although it is rather a shame that Rossini’s Cinders is still in her kitchen dress when she marries her Prince. 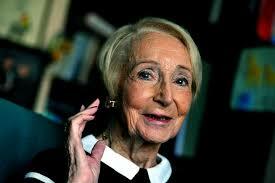 She does wear a sparkling tiara, but a bridal gown would have been nice. 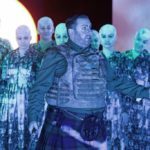 Other costumes – among them those worn by WNO’s legendary chorus – are colourful yet traditional in some respects, so why not keep this one? There are underlying themes – good triumphs over evil, etc etc – but this pantomimic take on Rossini’s popular comedy is fun and overall should not be taken too seriously.